Krampusnacht is celebrated every December 5! Come Christmas Eve, children throughout the world will patiently await a big, bearded man in a bright red suit. He travels by herd of reindeer and promises gifts for every good boy and girl. Polite and patient children can rejoice at the sight of Santa Claus, but the ill-behaved have a different holiday icon to answer to: a horned, demonic creature by the name of Krampus. Described as “half goat, half-demon,” Krampus is a Christmas creature who punishes children who have misbehaved. While Saint Nicholas rewards good children with gifts, Krampus swats bad children with bundles of birch branches he carries on his belt. It isn’t certain when the folklore began, but it’s theorized to date back to pre-Christian traditions. Krampus is commonly depicted as a hairy, horned creature with hooves, horns, and a man’s face. 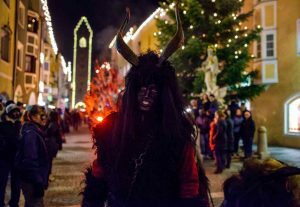 On December 5th, Krampus comes to life in Bavaria and much of Eastern Europe. Men and women dress as Krampus (horns, hair, hooves, etc.) and run through the streets to scare young children. Participants in this unusual holiday traditionally enjoy Krampus schnapps, a strong distilled fruit brandy. Saint Nicholas and Krampus can often be sighted together in children’s stories and Christmas drawings. Krampus acts as Saint Nicholas’ evil companion, and folklore describes tales of the two visiting children together. In parts of Europe, participants traditionally dress as both Saint Nicholas and Krampus during Krampusnacht. In some European countries, Krampus acts as a year-round reminder for young children. Parents mysteriously delivery birch sticks to children when they misbehave, and then hang the birch sticks up on the wall to remind young children to be kind throughout the year. AESU offers several trips to Europe, including Cosmopolitan, Euro Spree, Explorer, Euro Focus, and our most popular tour, Great Escape. This entry was posted on Wednesday, December 6th, 2017	at 11:31 am	. You can follow any responses to this entry through the RSS 2.0	feed. Both comments and pings are currently closed.